Living for the Glory of God, does mean at times that we will be fighting against the devil's scheming. Where there is good there is evil, where there is purity there is filth and where there is rule there is a temptation to break it. Our battle is with the rulers, authorities and powers of this dark world and the spiritual battle going on around us. In the study for Ephesians five, I addressed the thought that we can do all these 'good' things without God in our lives, and yes we can. We can challenge the rulers, authorities and powers of a dark world, but we cannot fight the spiritual battle without God. In your own strength the power of temptation can overcome you, the ways of the world can draw you in. These battles are not to be taken lightly, God knows that we will struggle, he knows that there is some power in darkness and he provides us with the armour for the battle. Through Jesus' death he has already overcome the darkness, so only in his power are you also able to overcome. You are in a living relationship with a living God and any relationships relies on communication so pray, always and for everything, pray. Hi! I'm visiting from Faith Filled Friday. We learned the hard way the need to pray at all times. We pray every morning, often in the afternoon, and again at night for safety, etc. Just like we brush our teeth twice a day, we should pray twice a day for God's protection and His guidance. 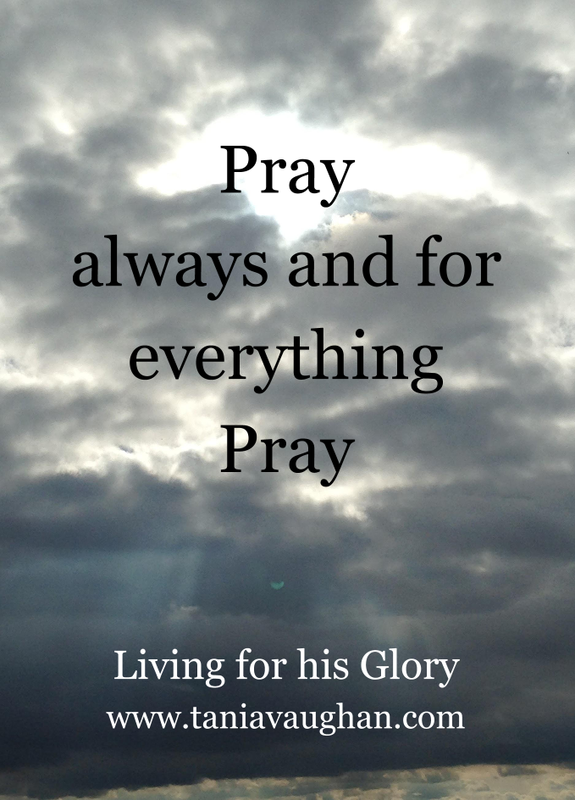 And yes, I totally agree that we should be praying continuously about anything and everything. It's about keeping our hearts attuned to God's. Thanks for sharing! I'm not sure we can ever say enough how often and how fervently we need to pray! Thank you for the reminder!